An Anchorage Alaska vacation is a long way from the Florida beach...several thousands of miles and an entirely different lifestyle. No Aloha shirts and flip-flops here in town right now. It was beautiful and sunny the next day...but after that it's been six days of cold and rainy weather. Not what I had in mind when my best friend, Dave, said, "Just bring your shorts. It's been warm up here all month." So far, I have spent most of my Anchorage Alaska vacation in the city library. It's a beautiful structure with free WiFi and a great little cafe inside. 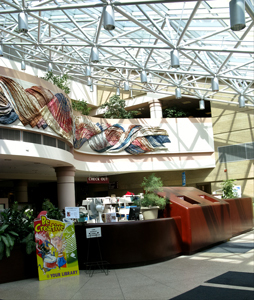 The architecture is ultra-modern and the roof is one huge skylight. I'm sure it is warm and inviting during the harsh winters up here, but this is not where I planned to be when I left the Florida beach. My plans included some great daily runs without the summer heat and humidity of Florida, lounging in some outside seating for lunch, taking pictures of the the incredible mountain ranges, and finding the best nightlife. Anchorage in the summer is a beautiful place. I want to spend every minute I can outdoors. There are a great many parks and great hiking/running/mountain biking areas right out of town. If you are the least bit athletic, an Anchorage vacation will be a good fit for you. I've got two weeks left, so I am not worried too badly. Actually, the sun has returned and even though it is about 65 degrees, the locals seem to be making great use of the downtown parks. 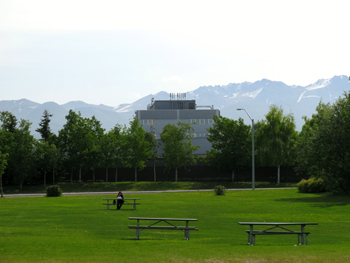 The lawns are thick and green...and the backdrop of the Chugach Mountains provides a scenic view that is matched only by the beauty of a quiet Florida beach. This Anchorage Alaska vacation should turn out pretty well. The weather forecast looks positive for sunshine, the Alaska Baseball League opens on June 8th, and my buddy Dave seems certain he knows a lot of great places to eat outside and have a cold one in some unique neighborhood bars. **Please keep in mind:When traveling and using public WiFi make sure that your computer is up to date on the top cloud security software to prevent viruses and other computer attacks from public internet.